Adventurous travelers can experience eco-luxury at its finest with a stay at this incredible private residence in Malaga, Spain. Situated a stone’s throw away from the beautiful Mediterranean Sea, The Olive Grove is a luxury rental property set on the edge of a nature reserve with views of the mountains and the sea. Best of all, the owners are dedicated to offsetting the home's carbon footprint and have incorporated a wide range of green features throughout the breathtaking property. 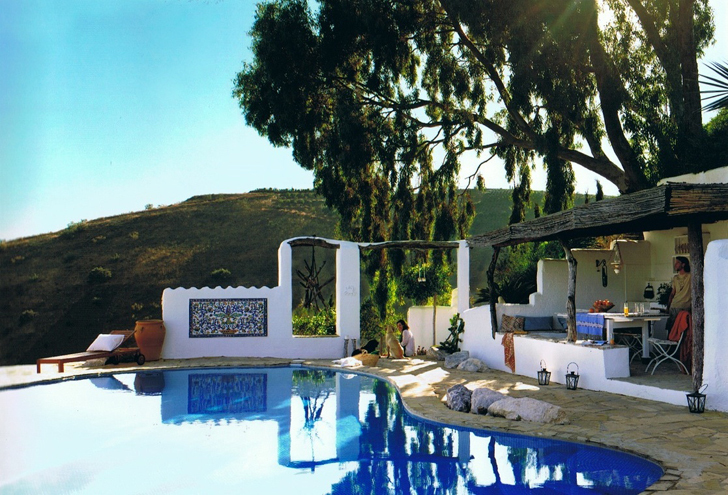 The unique farmhouse is designed in the traditional Spanish style and is packed with Spanish antiques, tapestries, authentic furniture and area rugs. Built to celebrate the natural allure of the surrounding landscape, the home has many open-air areas. An outdoor kitchen allows visitors to dine al fresco and indulge in the local fare. The property owners are committed to cutting down on transportation costs, so they stock the kitchen with produce grown right on site. Additional food is bought from locally sourced vendors from the nearby historic Moorish markets. They compost all left over food scraps on site as well. The back patio and pool are perfect for relaxing and taking in the views. The edge of the outdoor pool blends right in with the vista, creating a truly tranquil experience. All of the water in the house and pool is heated with a series of solar panels. The owners recycle all of their grey water, part of which goes to water the plants on the property, which are sustained with a water-saving irrigation system. The house is outfitted with low-energy lighting, high-efficiency appliances, and a wood burning heater. They owners also seek to give back to the land by planting indigenous trees along the hillside, which once was a forest. 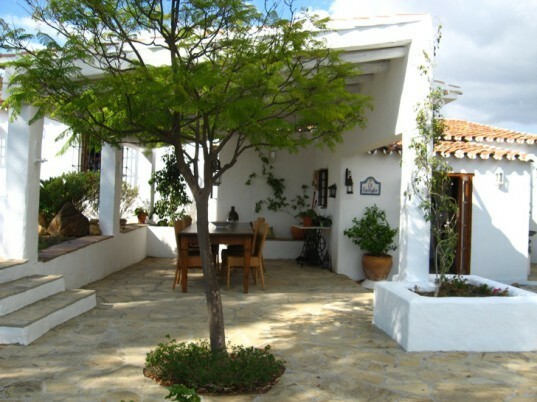 The amazing residence allows eco-conscious vacationers to experience Spain in quaint luxury. The unique farmhouse is designed in the traditional Spanish style and is packed with Spanish antiques, tapestries, authentic furniture and area rugs. Built to celebrate the natural allure of the surrounding landscape, the home has many open-air areas. An outdoor kitchen allows visitors to dine al fresco and indulge in the local fare. The property owners are committed to cutting down on transportation costs, so they stock the kitchen with produce grown right on site. Additional food is bought from locally sourced vendors from the nearby historic Moorish markets. They compost all left over food scraps on site as well. The back patio and pool are perfect for relaxing and taking in the views. The edge of the outdoor pool blends right in with the vista, creating a truly tranquil experience. All of the water in the house and pool is heated with a series of solar panels. The owners recycle all of their grey water, part of which goes to water the plants on the property, which are sustained with a water-saving irrigation system.